We provide a wide range of cosmetic services designed to enhance the way you look and feel. Every individual's choice of service and plan for treatments will vary so make your appointment for a FREE CONSULTATION so we can help determine the best package for you. Also, be sure to check out the current specials for some great deals. Click on any of the headings below to get more information about each service. Laser hair removal performed with the Lumenis One is an IPL technology founded and perfected by Lumenis, Inc. Any area of the body that grows hair can be treated. The ideal candidate is someone with fair skin and dark hair, though the Lumenis One has the potential to treat virtually any skin type with its sapphire chill tip and filtered technology. The FotoFacial is the greatest thing for treating hyperpigmentation, sun spots, brown spots/age spots, spider veins around cheek and nose, malasma and rosacea. Smoothing the surface of the skin, reducing poor size, and even skin tone are additional benefits of this IPL FotoFacial. In addition to the skin disorders, the FotoFacial will also remove any facial hair as another additional benefit. Microdermabrasion is recommended in addition to or between FotoFacial treatments. Zoom2! Teeth Whitening is the standard in the industry for teeth whitening. It is a process of four 15 minute sessions that last approximately one hour each. Derma Spa will give you maintenance suggestions for keeping your smile looking its brightest and best. Broken capillaries, or "spider veins," are a common issue with many people. Spider Veins can form on just about any body part, but are most commonly found on legs, face, hands and feet. The IPL laser vein treatment is very effective and can render good results with 1 to 3 treatments usually. The laser tattoo removal treatment works best on dark or black ink. It also works best with people that have light skin. The laser light seeks out the color and attacks and removes it. If the skin has darker pigmentation it can create issues, depending on how dark the skin. Typically it can take anywhere from 4 to 10 treatments - much of which depends on the depth, age and extensiveness of the tattoo. We use the Clear Light acne device by Lumenis which can treat almost all types of acne except advanced cystic acne. Dramatic results can be seen with the Clear Light. Typically it is best to come in 2 times per week for 3 to 4 weeks. After the initial treatment, maintenance may be needed. The treatment is very safe, good for your skin and it relieves one from having to take aggressive internal medications that can harm organs, immune system and other various side effects. With Clear Light, you won't have to worry about those things. We offer a variety of chemical peels. Depending on the desired result, sometimes we will recommend a chemical peel with microdermabrasion. The two render a very nice outcome and great results. Microdermabrasion is an aggressive exfoliation and can best be described as sandblasting your skin. It can be done on any body part, but is most commonly used for the facial area. It removes dead skin, clears pores, reduces fine lines and pore size and tightens up the skin. 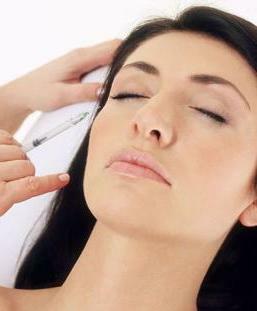 Derma Spa has a doctor that performs all the injectables offsite. If you are interested in botox or any filler services, please give us a call to set up your appointment.